Police, spectators, protesters and media all crowded into the space at Clark and Grand waiting for Donald Trump Monday afternoon ahead of his speech at the City Club of Chicago. Just two weeks into his presidential run, the billionaire real estate and media mogul attracted the curious and the angry. The anger is, in part, over Trump's remarks — which he later clarified — about immigration and Mexicans. "He called all Mexican-Americans and people whose heritage is from the continents drug dealers, criminals and rapists," said Darryl Morin of the League of Latin American Citizens during the protest. 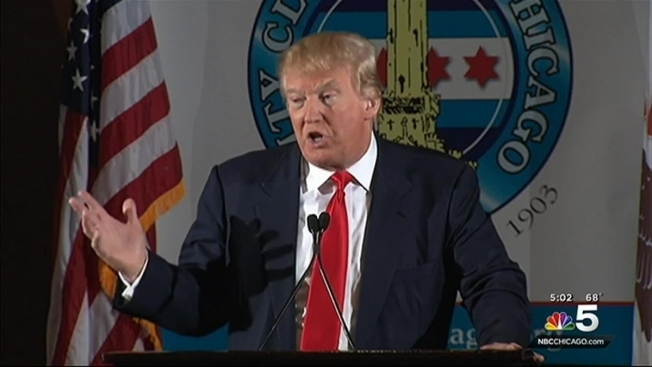 Trump addressed the criticism during his speech at the City Club. "First of all, I love the Mexican people," he said. "But at the same time, we have to have borders. If we don't have borders, we're essentially not a country." City Club officials say they received 5,000 ticket requests, but only 300 were able to get inside for the event. Outside, protesters urged NBC to "dump Trump" as well as his program "The Apprentice" and the Miss U.S.A. and Miss Universe competitions. In a meeting with reporters, Trump was matter-of-fact in talking about NBC's decision to sever its relationship. "I think as far as ending the relationship, I have to do that because my view on immigration is much different than the people at NBC," Trump said following his speech at the City Club. Trump faces his first presidential debate in August.